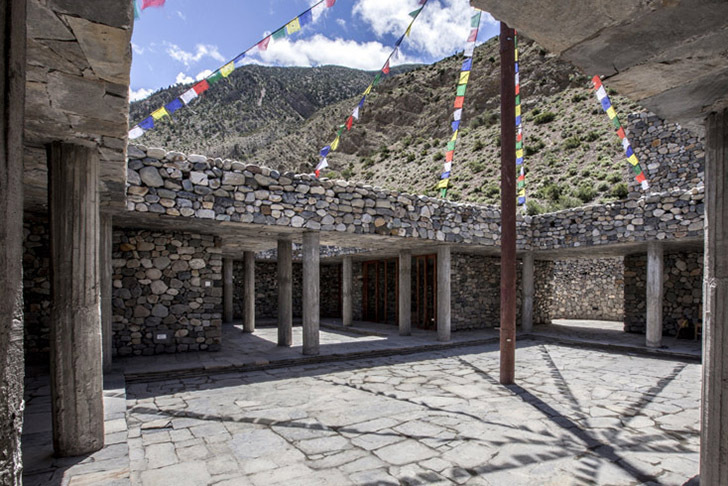 Korean studio Archium designed this beautiful rock building for a Nepalese radio station in Jomsom. Set against the region's beautiful natural landscape, the Mustang Broadcasting Communi (MBC) is made from concrete, wood and plenty of local grey stone that protects it against strong winds. The new stone building sits 3,000 meters above sea level and it features a rising antenna with strings and colorful flags attached. The project was inspired by vernacular architecture, and the rooms are organized around a central courtyard. The building is mostly made from local gneiss stone, although wooden details in the furniture, windows and doors provide the interiors with some warmth. Hand-carved stools made from solid tree trunks stand against the grey walls. Several of the rooms are paved in the same irregular stones used for the outdoor spaces, while others feature tightly packed smaller stones. Made by locals from local materials, this unique radio broadcasting station totally rocks. The new stone building sits 3,000 meters above sea level and it features a rising antenna with strings and colorful flags attached. The project was inspired by vernacular architecture, and the rooms are organized around a central courtyard. The building is mostly made from local gneiss stone, although wooden details in the furniture, windows and doors provide the interiors with some warmth. Hand-carved stools made from solid tree trunks stand against the grey walls. 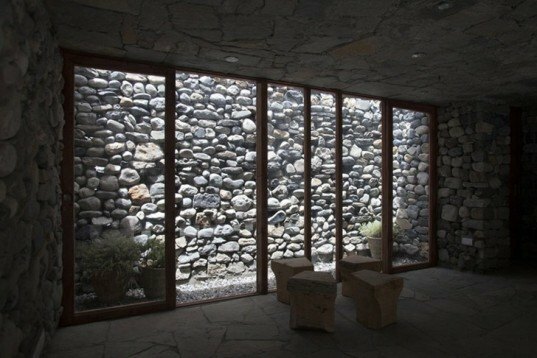 Several of the rooms are paved in the same irregular stones used for the outdoor spaces, while others feature tightly packed smaller stones. Made by locals from local materials, this unique radio broadcasting station totally rocks.